Charging Practice is a series of full-length asana practices that focus on two crucial elements of Dharma Yoga: self-exploration and mental concentration. 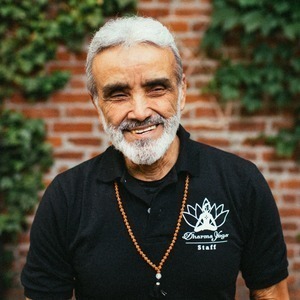 Sri Dharma Mittra is a living yoga legend who has dedicated over fifty years to the intense study and teaching of yoga. His powerful yet graceful approach blends the physical asana with breath-work and meditation. 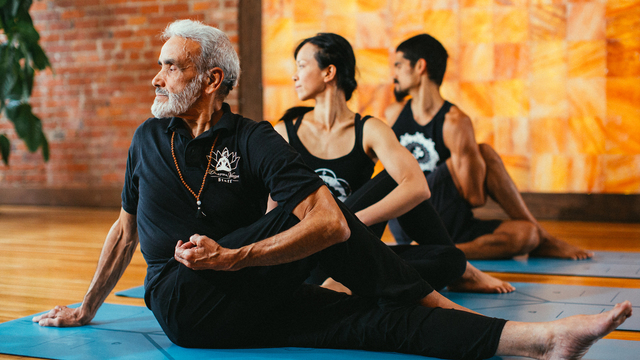 In each strong, uplifting flow class Sri Dharma directs your awareness inward and teaches you to use the physical asana to enter a conscious and meditative state. You will stimulate body and brain by gently bending the spine and going upside down. The slow-moving sequences and long holds between poses allow for meditation and awareness on the Trikuti, the third eye. By learning to gather your mental and spiritual powers into your physical asanas, you will end each practice feeling calm, energized and spiritually inspired!